Claeys horehound candy drops are an old fashioned candy. Made with 100 % natural horehound herb tea. Claeys horehound candy is still brewed in copper kettles to enhance the flavor and has a light sugar coating. These hard candies are not only good to eat but horehound drops are also great for soothing a scratchy dry sore. throat. Some say they also work well as a appetite stimulant. These are a favorite old school candy which can be somewhat hard to find. At one time these could be purchased in every general store, dime store and country store. Not only to we carry horehound drops, but we also carry Anise,Lemon Drops, Licorice, Sassafras, Watermelon And Wild Cherry. Each bag is 6 oz. and has approx. 39 pieces of fat free hard candies made in the USA. Grandma knew about the soothing benefits of horehound herbal tea. That same natural flavor can be found in Claeys old fashioned horehound candy drops. The essence of these imported horehound herb is obtained by brewing the herb in large copper kettles. The tea is then mixed with sugar and corn syrup to produce the brown lozenges. 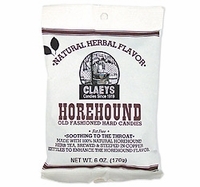 Claeys horehound is made with 100 % natural ingredients , you will find no preservatives or artificial flavoring added to these old time candies. Claey's candy company has been around since 1919 a three generation company that commits to quality candies. Horehound was a flavor from my parents� generation. I was introduced to the taste as a fourth grader. I always got the lead parts in the school plays, but not because of my acting ability or my outgoing personality, of which I possessed neither. I had the ability to memorize the lines, a skill which got me cast in a silly skit. We went to a rural grade school where Christmas programs were a tradition. All eight grades rehearsed for a month, during which time very little schoolwork got done. That year, the burden of the role of a lady named Eager Em was on my shoulders. My classmate Mike was Bashful Ben and a boy named Bruce played Santa Claus. Ben was courting Em. He was shy and the forward Em couldn�t get him to pop the question. Ben was so nervous he made reference to the �Rears Soebuck catalog�, which got a hearty laugh. At one point he offered her horehound candy, a questionable courtship ploy. We used genuine horehound candy as a prop, and I really didn�t like the taste. In the end the sweethearts fell asleep and Santa had to put the ring on Em�s finger. When they awoke, they were officially engaged.